Some of you might recall I’ve developed an interest in night photography using an array of remotely triggered flash units. That’s what I was doing last night, 9/23/2017, in Sugar Land, near MP 25 of UP’s Glidden sub. One train, Amtrak #1 had gone by me about 7:35 PM, and I was adjusting my flash units in anticipation of another westbound train which my ATCS screen showed to be at West Junction, about 13 miles east of my location. To say that I was shocked would be an understatement! After a few double takes to comprehend what had just happened, I ran over to the driver’s door to check on the driver. It was an elderly Asian fellow who told me that he turned onto what he thought was the street. He then asked if I would help him push his, very stuck in the ballast on the passenger side, and high centered on the rail head on the driver’s side, car. 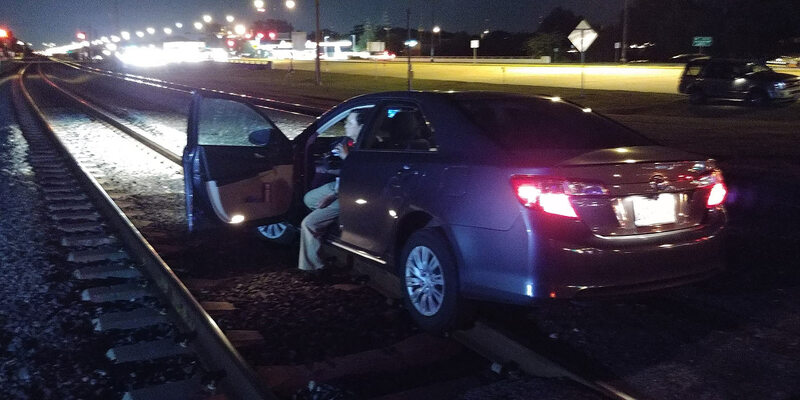 I told him there was no way we could push the car free and that he needed to get out of the car because a train was on the way. 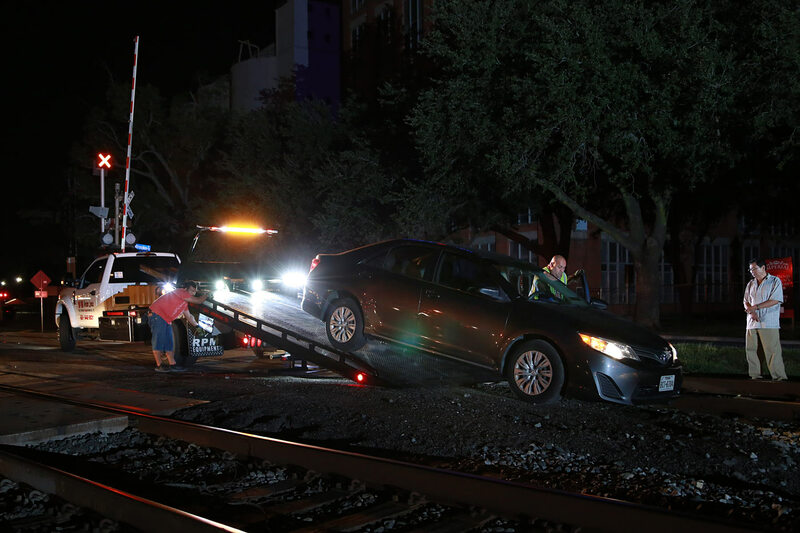 As he got out of his car, I called UP’s Terminal Dispatcher #2 to advise him that there was a car stuck on main #1 at MP 24.56. After answering a few questions for him, he told me that he was putting a block on both mains at my location. I then told the dispatcher that I would call 911 to get police and wrecker assistance to our location. Once the police arrived, I looked at the ATCS screen to see where the westbound I was waiting for had stopped. Note the two blue segments near Sugar Land Yard. 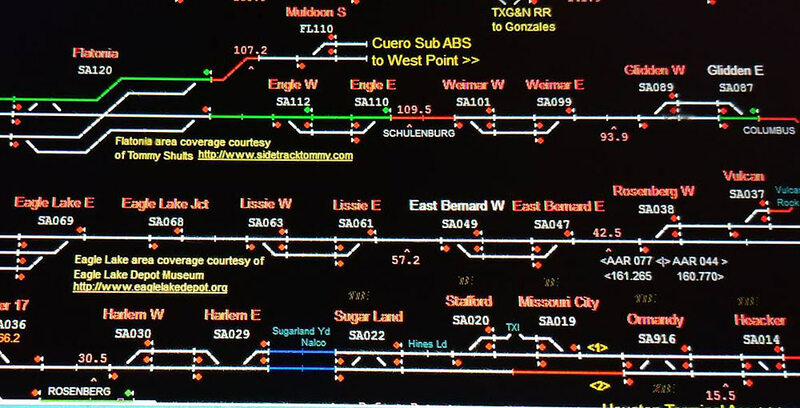 They show the dispatcher track block. Note the red segment to the right. That’s KCS 4002 which was stopped after my call to the dispatcher, just a bit over 5 miles from the location of the stuck car. Not to be overly dramatic, but had I not been taking night pictures at that spot, there might have been a very different ending to this story. 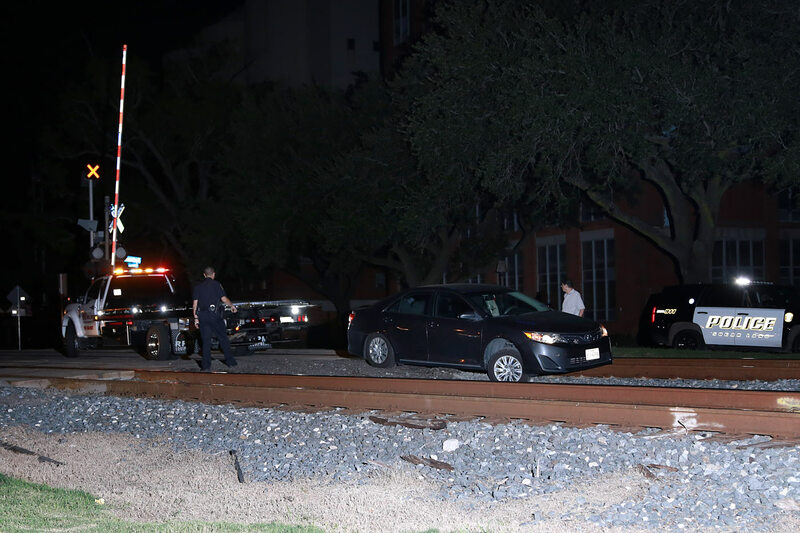 Long story short, police arrived to the scene promptly, a wrecker shortly thereafter, and the car was pulled off the track by 8:35 PM. 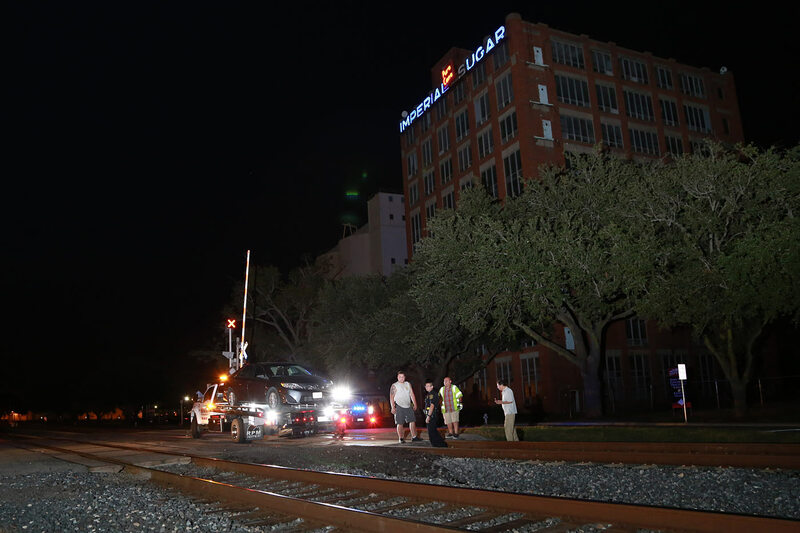 Trains didn’t start moving again until 9:40 PM account the time needed for a UP track inspector to reach the scene to ensure the track was not damaged. Since I had a camera and lights handy, I captured a few views of the recovery operation. What a documentary! I bet UP is happy you were there! Something similar happened to a pair of drunks in Angleton back about 1982. In broad daylight, the driver turned down the mainline just as the north end switcher was pulling out of the yard with a long heavy cut of cars. 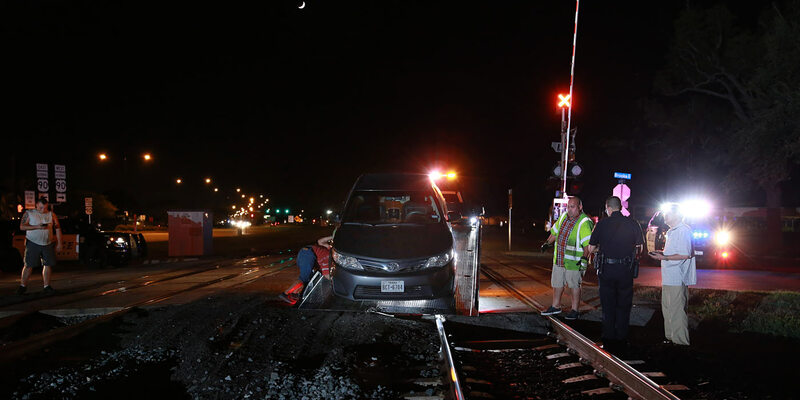 The locomotive “hit” the car at about 2 mph before the engineer could get stopped. 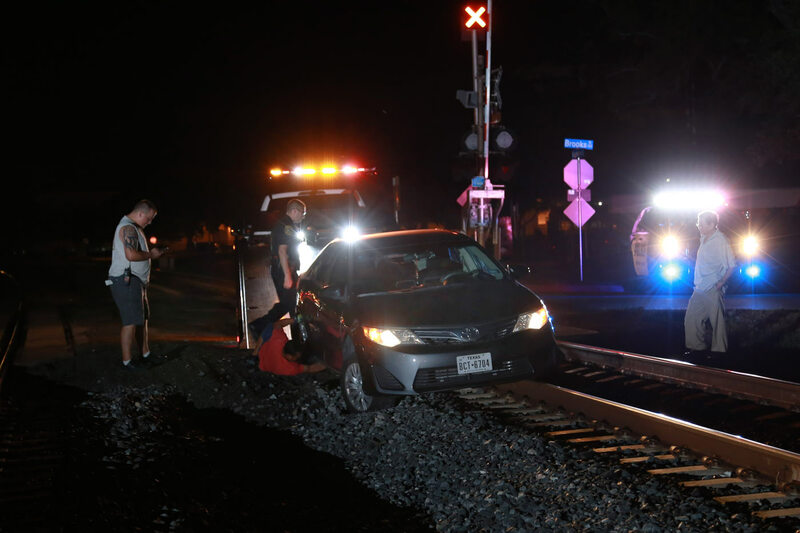 The car was shoved about halfway to the next crossing. The drunks tried to get the engineer to push them all the way to the next crossing, but he would have nothing to do with that. The Angleton police showed up and carted them off to jail. Appears you were in the right spot to prevent an accident, if not fatality. It seems many other similar incidents have appeared since advent of GPS units in recent years, as reports in the social media.! We are very thankful for your presence and presence of mind in avoiding what could have been, as you say, a very different ending!